For menu and recipes click here. For fashion designer Lela Rose, the process for sketching a garment or dressing a table starts with the same approach—and of course has nothing to do with innate creativity. “A gracious attitude is the key to showing that effortless style that turns heads,” says the Texas-bred Lela, whose frequent trips to the farmer’s market in her Manhattan neighborhood supply her regular gatherings. An intimate dinner she recently hosted gave a playful nod to one of her favorite childhood tales. Lela wanted the theatrics of Alice in Wonderland for her table, but presented in a grown-up manner. The “looking glass” of the famous story took the form of an ingenious feature of Lela’s living room—a space-saving glass table that lowers from the ceiling via cables to create a dining area. Whimsical white Alice in Wonderland candleholders are traditional in placement if not in design. The candlesticks led to other white table accoutrements—chosen for their modern style, not solely as a neutral foundation. 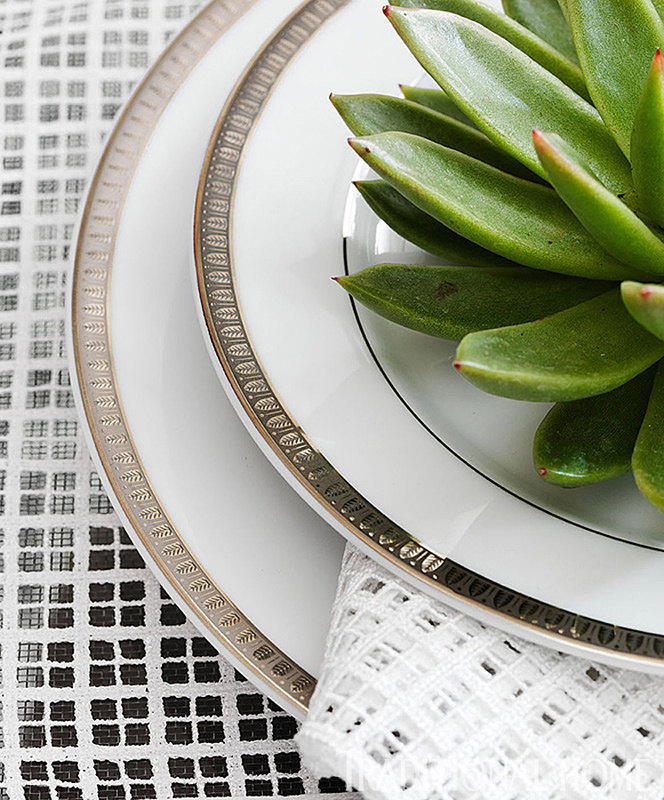 Placemats convey a contemporary vibe, rendered in lace but with an unexpected geometric pattern that isn’t too feminine or pristine. 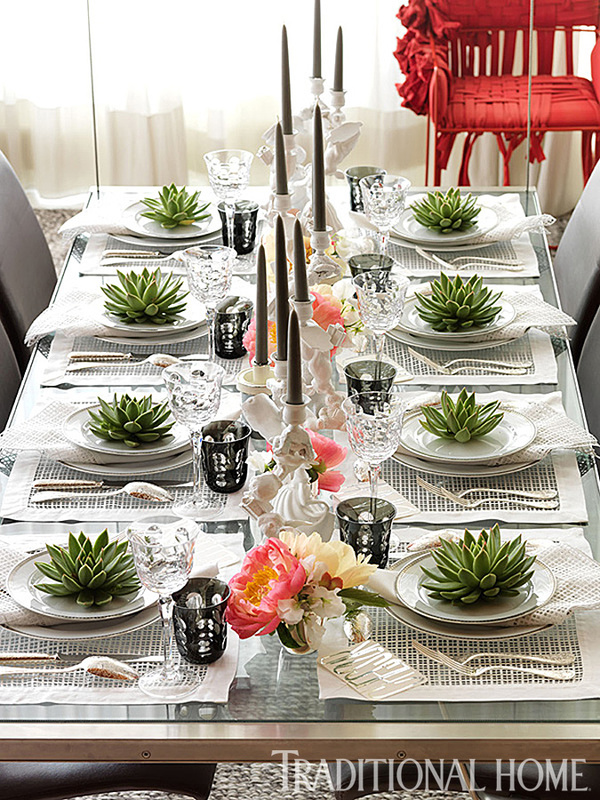 Porcelain plates with a platinum border frame sculptural succulents that decorate the pre-dinner table. “Malmaison Platine” porcelain dinnerware, “Kawali” crystal wine goblets, “Kawali” gray crystal tumblers, and “Jardin d’Eden” sterling flatware; all from Christofle. Fabrics from Lela’s past collections were used to re-cover a boomerang-shaped sofa and a wing-style chair, which Lela inherited from her mom. She painted the chair black and covered it with a sequin-emboidered fabric. 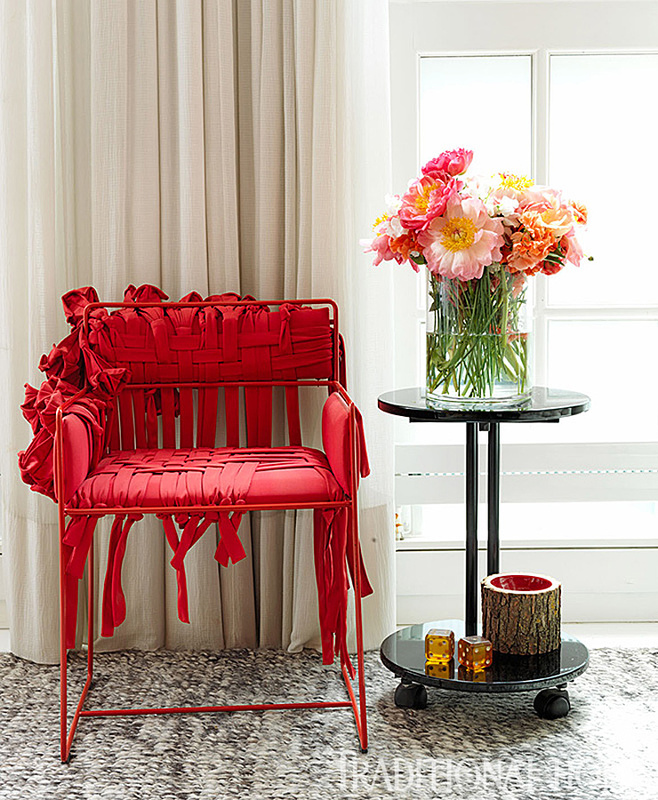 Strips of red fabric are woven over a chair frame bought at auction. We assembled variations on Lela Rose’s table scheme to give more options you will love. 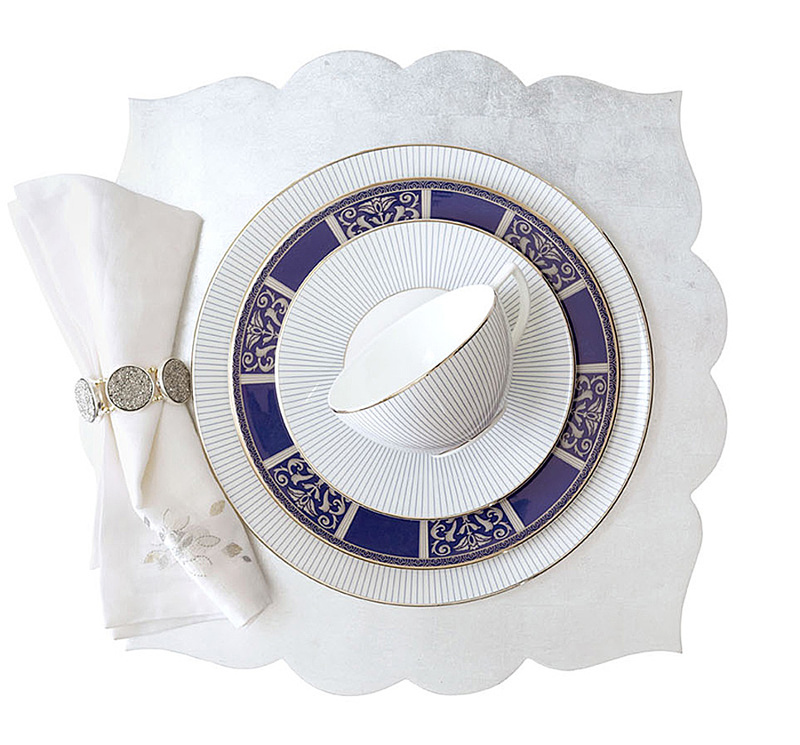 “Vera Moderne” cup, saucer, and dinner plate; Vera Wang for Wedgwood. Lenox “Landmark Platinum” accent plate; Replacements. 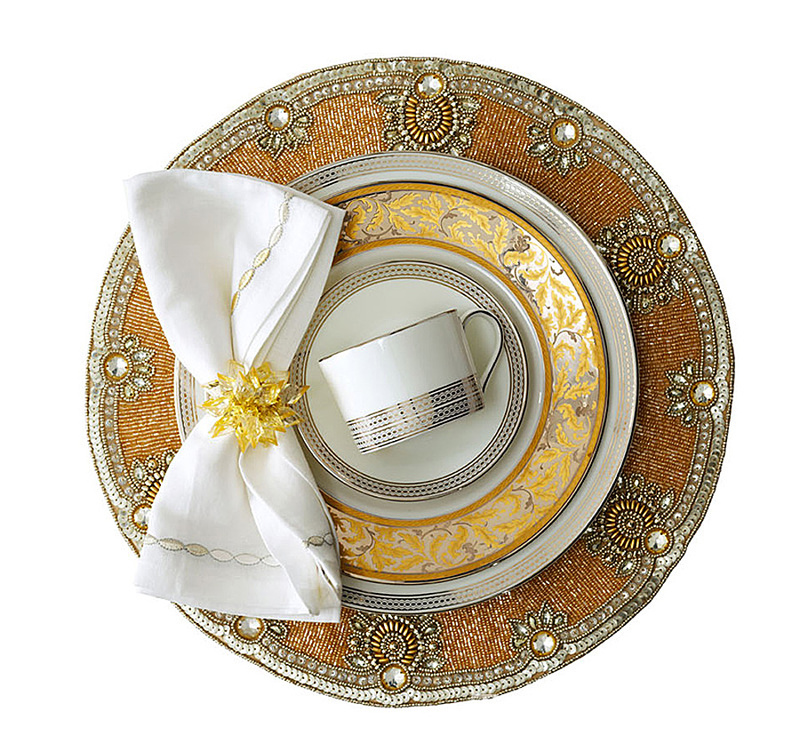 “Corded Ombre” embroidered linen napkin, “Mum” beaded napkin ring in champagne, and “Versailles” beaded placemat; all from Kim Seybert. 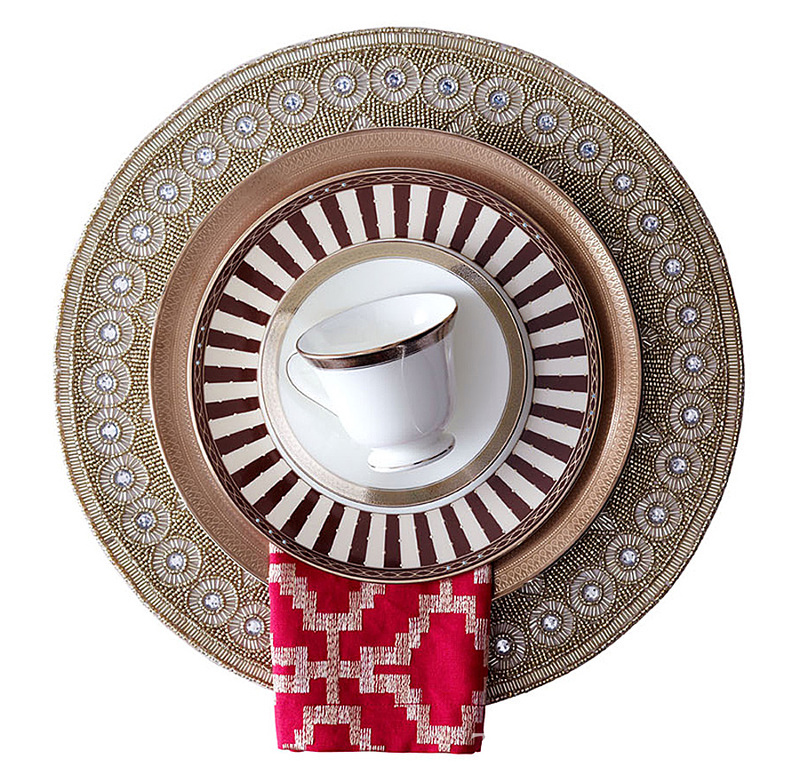 “Fez” scalloped placemat in silver, and “Spectrum” embroidered linen napkin; both from Kim Seybert. “Blue Pin Stripe” bone china dinner plate, teacup, and saucer; Wedgwood. Vintage Royal Doulton “Byron” accent luncheon plate with platinum decoration; through Replacements. “Newgrange” platinum-banded cup and saucer; Waterford. Waterford “Catania” salad plate, and Pickard “St. Moritz” dinner plate; both through Replacements. Napkin made from “Sarana” embroidered fabric in raspberry; Schumacher. “Kaleidoscope” placemat; Kim Seybert. 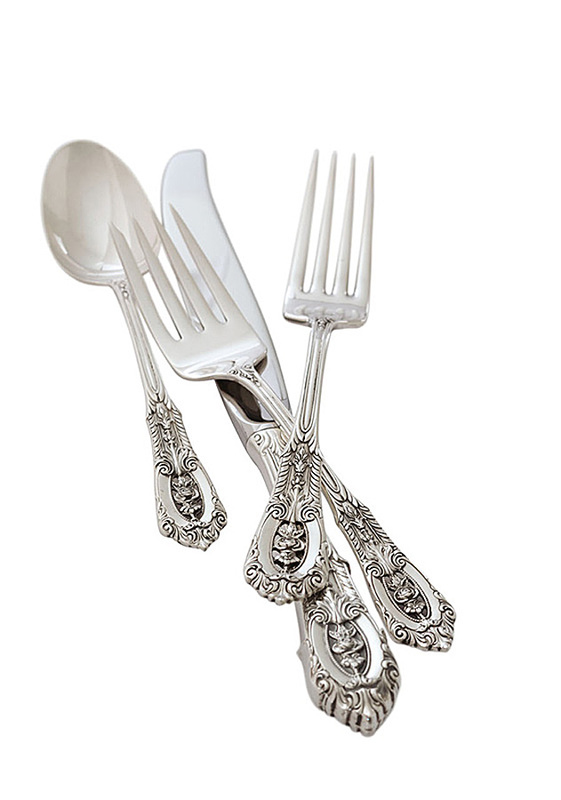 Pictured: Against white dinnerware, ornate flatware such as Wallace "Rose Point" sterling offers a striking contrast. In cocktail shaker filled with ice (crushed ice is best), combine bourbon, maple syrup, and lime juice. Shake; strain into rocks glass with ice. Top with ginger beer. Makes 1 cocktail. If you don’t have a mandoline, you can thinly slice the Brussels sprouts or simply cut the root end to release the leaves. Using a mandoline, thinly slice Brussels sprouts. 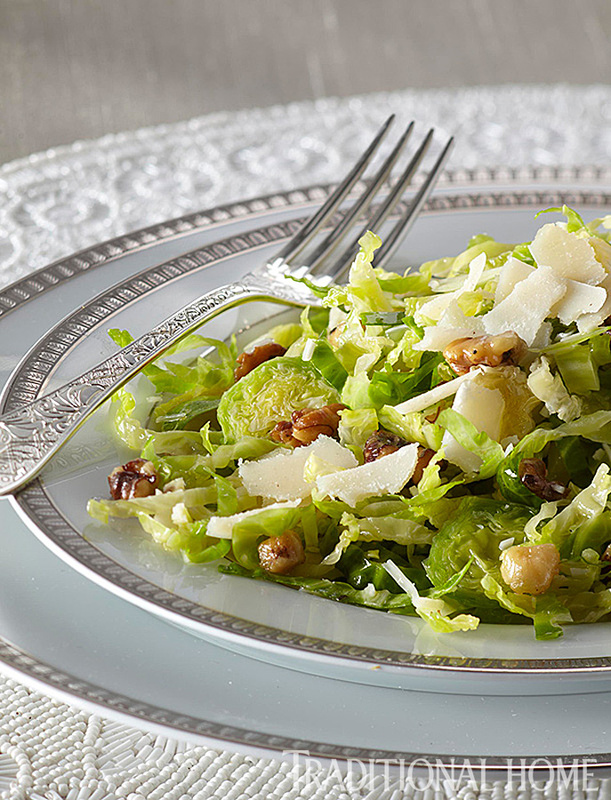 In large bowl combine sliced sprouts, walnuts, olive oil, lemon juice, 1/2 ounce cheese, 1/4 teaspoon salt, and 1/4 teaspoon pepper. Season to taste with additional salt and pepper. Top with shaved Pecorino Romano. Makes 4 servings. 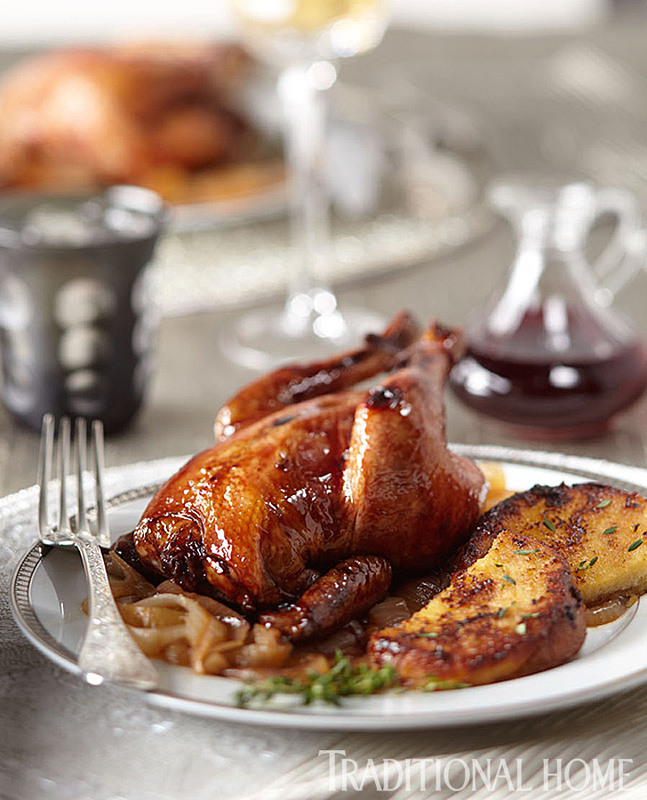 Several steps in this recipe require make-ahead preparation: The Cornish hens should be marinated 6 to 24 hours; the bread for the pain perdu should be soaked overnight. For Pomegranate Molasses, combine pomegranate juice, sugar, and lemon juice in large saucepan. Bring to boil over medium-high heat, stirring to dissolve sugar. Reduce heat and simmer, uncovered, about 1-1/4 hours or until mixture is reduced to 1 cup, stirring occasionally. Cool completely. Place Cornish game hens in 3-quart rectangular baking dish. Brush hens with half of molasses mixture. Cover, refrigerate hens and remaining molasses mixture 6 to 24 hours. For charcoal grill, arrange medium hot coals around drip pan. Test for medium heat above drip pan. Place hens, breast sides up, on grill rack over drip pan. Cover; grill 50 to 60 minutes or until tender and no longer pink (175°F), brushing with remaining molasses the last 5 minutes of grilling time. (For gas grill, preheat grill. Adjust for indirect grilling. Place hens on grill rack away from heat. Cover; grill as above.) 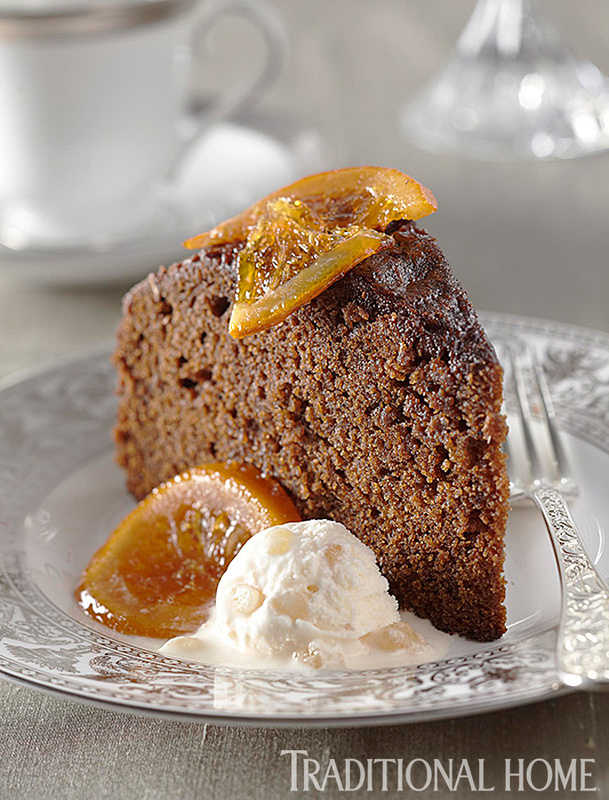 Drizzle with remaining molasses when serving. For Sweet Onion Pain Perdu, in small saucepan combine cream, vanilla bean, and nutmeg. Bring just to boiling over medium heat. Reduce heat; simmer, uncovered 5 minutes. Remove from heat; let stand 1 hour. Strain mixture, discarding solids. (May be done one day ahead: Strain mixture; refrigerate up to 24 hours). In shallow dish whisk together eggs and salt. Whisk in cooled cream. Dip bread slices in cream mixture, turning to coat. Place coated slices in 3-quart rectangular baking dish. Pour remaining cream mixture over top of bread. Cover; chill at least one hour or overnight. In large skillet melt 2 tablespoons butter over medium-low heat. Add onions. Cook, covered, 13 to 15 minutes or until onions are tender, stirring occasionally. Uncover; cook and stir over medium-high heat 3 to 5 minutes or until golden. Stir in thyme. Remove caramelized onions from skillet; keep warm. Wipe skillet clean. Heat remaining butter in same skillet over medium heat. Sprinkle one side of bread with turbinado sugar. Add slices to skillet, sugared side up. Cook about 5 minutes or until golden brown. Turn slices over; cook about 5 minutes more or until golden brown. To serve, top with caramelized onions. Serve alongside Cornish game hens. Makes 4 servings. Let eggs stand at room temperature 30 minutes. Preheat oven to350°F. Grease and flour 9-inch springform pan. In large bowl combine molasses, 1 cup sugar, and oil; set aside. In medium bowl, sift together flour, cinnamon, cloves and black pepper; set aside. In small saucepan bring 1 cup water to boil. Remove from heat; stir in baking soda. Stir hot water and ginger into molasses mixture, stirring until just combined. Add eggs, stirring until just combined. Gradually whisk in flour mixture until just combined. Spread batter into prepared pan. Place foil-lined baking sheet on oven rack below cake to catch any drippings. Bake about 1 hour, until top of cake springs back lightly when pressed or toothpick inserted into center comes out clean. If necessary, loosely cover with foil for the last 10 minutes of baking to prevent overbrowning. 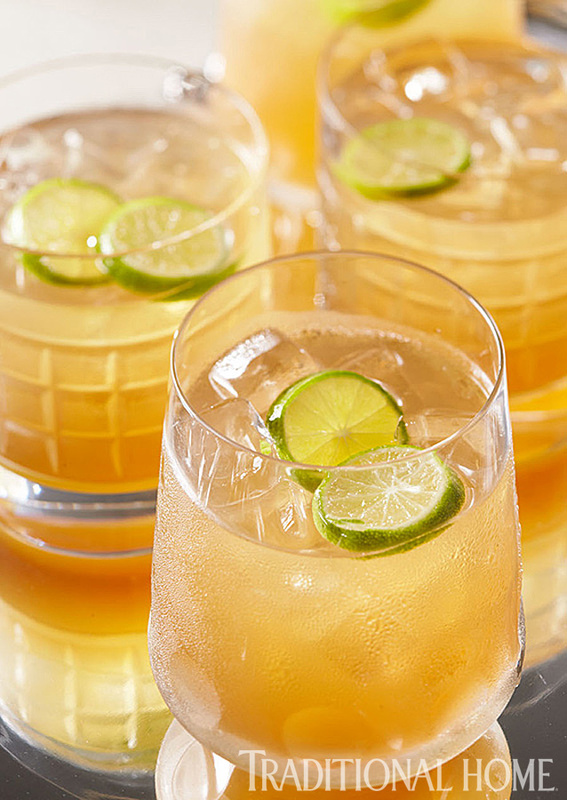 Bourbon may be substituted for the whiskey in this recipe. In small bowl, combine 2 tablespoons milk with cornstarch; set aside. In large bowl, combine cream cheese and salt; set aside. In large saucepan combine whipping cream, sugar, honey, and remaining milk. Bring to rolling boil over medium-high heat. Reduce heat; simmer, uncovered, 4 minutes (timing is critical). Remove from heat; gradually whisk in cornstarch slurry. Return mixture to boil over medium-high heat. Cook, stirring until mixture is slightly thickened, about 1 minute. Remove from heat. Gradually whisk hot milk mixture into cream cheese until smooth. Cover; chill at least 4 hours or until chilled. Freeze cream mixture in 2-quart ice cream freezer according to manufacturer's directions. During last 2 minutes of processing, add whiskey. Stir in ginger. Transfer ice cream to freezer container. Cover; freeze at least 4 hours to ripen. Makes 12 servings. 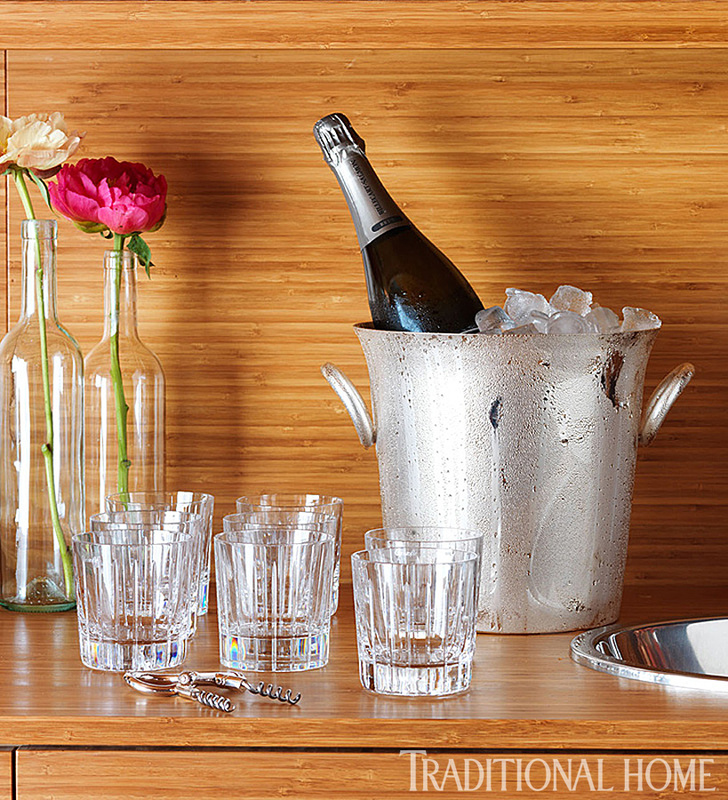 Click here to see another fashionable dinner party.